There's nothing more relaxing in the Winter than a big ol' roaring fire in the fireplace, but it's even more fun when you toss in these cool new Color Cones. As these little pine cones burn, they transform boring flames of orange and red into magical blue and green for around ten minutes. Available in 5 or 2 pound rustic burlap sacks or in a 1 pound basket. 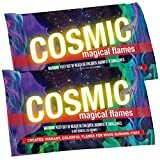 Also great for fire pits. 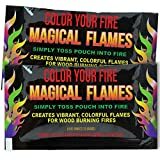 Magical Flames 12-pack: TWICE THE COLOR, half the price!